"Why did the protesters go to the embassy of the United States in Cairo? ", "The police has all the right to stop them, no matter what" and "Those protesters are mainly stupid and brainwashed". Those are mainly the phrases you are going to see if you happen to follow the Egyptian activists and netizens nowadays. Like many others, I am against those protests since day one. What's the problem of those protesters? How come it is the USA that is to be blamed just because some people decided to make a film there that the angry protesters find it to be against their religion? Let alone the killing of innocent people in Libya and waving Al-Qaida flag on the anniversary of September 11. And now the protesters are asking for an apology from the States, an apology for having freedom of speech laws! Why not, when we have scholars who call for killing those who participated in that film. Thanks to the angry protesters who made it easy for me to take such stance this time. I have no reason to sympathize with them. But a year ago, and even during the early days of the Egyptian revolution, I happen to be on the other side of the table. The Egyptians were protesting against the ruling military junta, and back then those whom we used to call remnants of the old regime used to say the exact same phrases I mentioned above to the protesters. "Why did you go to Mohamed Mahmoud street? ", "The police has all the right to defend the state against those angry protesters" and "You're brainwashed and following foreign agendas". I can sure say that the military junta was killing and arresting people, controlling the media, and they were not democratically elected and ruling the country by brute force, so we had all the right to protest then. And as I said above, the protesters now have no reason to protest this time. But this doesn't seem to be an enough answer to my wonders. Photo taken by Gigi Ibrahim, under Creative Commons license. For every protest, in order to unify all protesters, there should be a reason to unify them under its umbrella. Reasons do vary from toppling a regime, to ending military rule, to seeking the rights of the martyrs (like many protests last year). And reason for today's protest are defending Prophet Muhammad. The more noble the reason is, the more easier it is to make others sympathize and even join the protest. But if you give it a second, and a more pragmatic, thought. You'll find out that most of the times those reasons can be noble and true, yet, still there are other reasons that are normally not announced. And here comes my own interpretation of protesting outside the box, that you might choose to agree to totally disagree with. I think that the main reasons for the protest in front of the embassies of the United States, at least in Egypt, is that the Salafy's felt they were left out. After the Muslim Brotherhood seized the power, they didn't give the Salafy's as much posts in their government as they were expecting. So my interpretation for the protest is that the Salafy's are mainly trying to get back into the picture and to prove to everyone that they have power in the street and can mobilize people. The Muslim Brotherhood on the other hand seemed to be against the protests in the beginning. Most of my friends who are either members of the MB or just emotionally affiliated with them were against it, and they were using the exact reasons I mentioned above for not being in favour of the protests. A short while later, they Brotherhood and Morsi found out that one of their main assets is that they present themselves to the people as an Islamic group. And for sure not participating in "defending Prophet Muhammad" will make them loose a lot of the credibility among their supporters and offer such credibility to the Salafy's on a silver plate. So later on, the Brotherhood changed their tone, and started to call for a million man march in support of the cause. But once more, they realized that they are now in power, and they don't only deal with local matters, but they also have international relations to look after. Hence Morsi and Khairat El Shater were very cautious doing their tightrope walking and trying to please both the Egyptian voters as well as their own peers in the White House. Many activists might hate me for this, but the protests that took part last November and December, also had secondary reasons other than toppling the military junta and seeking the rights of the martyrs. 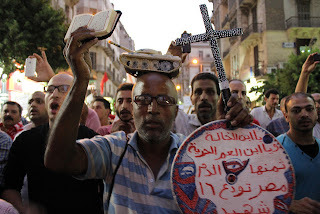 The Brotherhood used to say then, that the protests are happening few days before the parliamentary elections, and the non-Islamist protesters are trying to postpone or even cancel the elections since they are sure that the Islamists are going to lead in the elections. I didn't agree with that back then, and I still don't agree much with it now, but I think they weren't totally wrong either. Part of the protests were a way for the protesters to get themselves back to the picture before the elections and a way to grab the voters attention. Few days ago the Ultras (football fans) were demonstrating in front of a football stadium as they didn't want the Super Cup match to be played before the ones behind the killing of 74 football fans last February to be punished. No one can deny how noble is their cause, yet it was hard for me to see it as the only reason behind the protest. Many more protests in front of the Minister of the Interior or the Israeli embassy, etc. They all needed a second thought from you to tell what are their secondary, or may be primary, unannounced reasons. I just realized now that there is no ethics in politics, or let me say, there is not absolute good and bad there. Two parties might do the same thing, yet you chose to side with one and stand against the other. I used to do this, and I guess I will continue to do the same. Sometimes the devil is in the details of each action, and that's how you can decide which one is ethical and which one is not. But most of the time you just have to follow your senses. And I do not mean by this that you shouldn't try your best to make the most ethical choices, in fact, I just want you to stick to your ethics all the time. It's only that things will rarely be that clear, so keep your eyes wide open and be ready for all possibilities. Nice post! Makes me want to go do a little more research, which is a good sign.